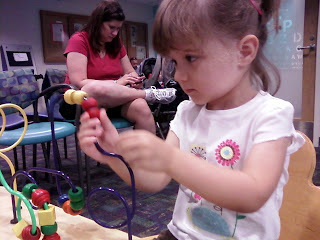 Today Mom an I took Alyce for another eye doctor appointment. Luckily this time it wasn't something related to her Strabismus problems of her past. This time we were bringing her in for a bump on her eyelid. She has had this for some time and we were hoping it would take care of itself. Sadly that wasn't the case. Alyce has a Chalazion which is a cyst in the eyelid that forms because of a blocked gland. Apparently it needs to come out because it can put pressure on the eye affecting her vision. The surgery is pretty straight forward (I won't go into details) but it should take longer getting her to fall asleep and waking back up than the surgery. The doctors visit wasn't too bad. Alyce is at the age where she has an opinion and not afraid to voice it. In our case her opinion was to not cooperate with the doctor. I think she was scared of all the equipment and she is shy so a stranger getting close to her face and eyes isn't a good way to make a first impression. 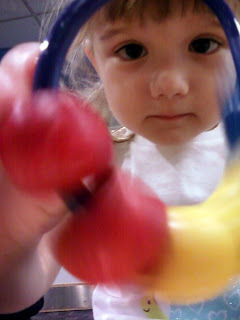 Eventually we did get her to cooperate enough that they could check out everything they needed too. 1 comments on "Another Surgery in our Future"